This is the microscopic appearance of normal proliferative endometrium in the menstrual cycle. The proliferative phase is the variable part of the cycle. 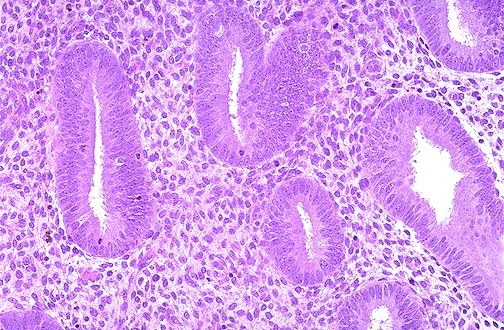 In this phase, tubular glands with columnar cells and surrounding dense stroma are proliferating to build up the endometrium following shedding with previous menstruation.